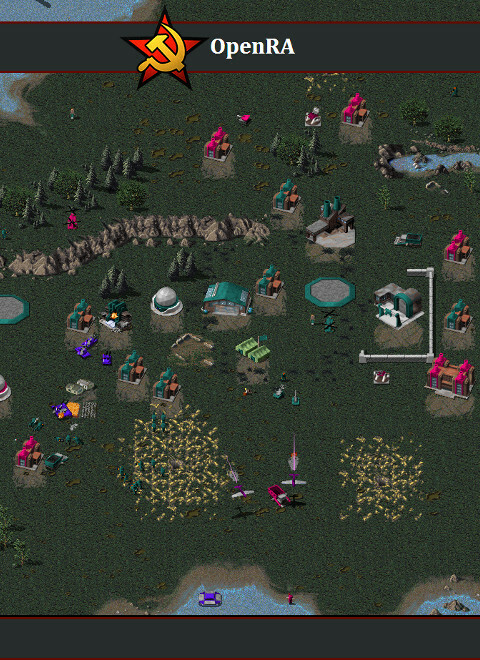 OpenRA is a highly moddable RTS game engine for classic Westwood 2D games. In fact Red Alert, Command & Conquer and Dune 2000 are implemented purely as mods on it. 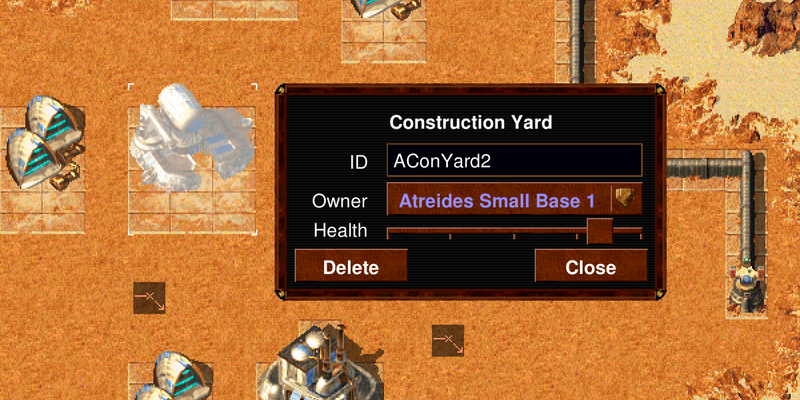 Tools are provided that allow you to add new units, maps and tilesets even create your own mod. Have a look at the wiki. The RA mod for OpenRA is a reimagining of Command & Conquer: Red Alert. It is not just a clone of the original but has improved and rebalanced gameplay. The UI is modernised for higher resolutions and better usabiltiy. 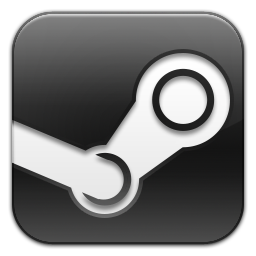 It has fully working multiplayer support for both internet and local play (via direct connect). The CNC mod for OpenRA is a reimagining of the original Command & Conquer: Tiberian Dawn game. As with Red Alert modern networking and rendering technology is used. Also new features are implemented such as snow terrain, neutral tech buildings and many glitches from the original have been fixed. The D2k mod for OpenRA is a reimagining of Dune 2000. A remake of the remake so to speak. It separates itself from the rest of the C&C series in terms of lore, certain game mechanics and file formats, but also shares a lot of technology with it's spiritual successors. Avoid the sandworms and build your base on stable foundations. The spice must flow! Another, hopefully final, test build on the road towards the next release. The mod name has changed from Fanwars to Fractured Realms! 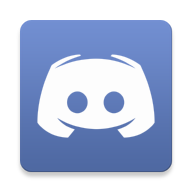 Also, we now have our Discord server. I really love your open-sourced C&C game engine. I've been playing it like crazy and would love to see at least some indie, original games from this engine. Also, when are you going to input that aircraft carrier logic? Dunadann Appreciate your comments, fellow commander! Absolutely - either the BTR-80 or BTR-60 would be suitable as the Soviet APC, I'd say :) For sure it should move just slightly faster than the M113, but then perhaps it should have slightly weaker armor too? If the BTR-60/80 were introduced, I wouldn't enable it to traverse water. I feel that'd just open up a can of worms for gameplay; so, best not to have it do that, even if they actually can in real life. Second, the Hind shouldn't transport any infantry. I think that also would open up a can of worms; its role should just be a gunship anyway. Which then leads me to a new suggestion: The Soviets are in need of an air transport, so I propose they get the Mi-26 "Halo". Sometimes there can be maps that requires an air transport where, without one, the Soviets would be at a huge disadvantage (eg: oil derricks behind impassible ridges). In fact, the Soviets did have the Chinook in the original game, but just as the Allies shouldn't have the Hind, the Soviets shouldn't have the Chinook. It would require creating yet another new unit for the game, but, while I think care and consideration should be taken before introducing any new unit to a game (otherwise you risk changing the game too much and begin losing the essence of the original), this one makes sense to me. And as someone who grew up with and cherished the original game, I guess I'd also view it as: If there had been one more expansion pack, what new units would that possibly introduce? So, if the Chinook carries 8 infantry (as of now), should the Halo carry 10? Or have the Chinook carry 5, as it did originally, and let the Halo carry 8? And since the Halo should carry slightly more infantry than the Chinook, it should be slightly slower. Well I better wrap this up before it gets TOO lengthy XD Thanks again for reading guys! Hey guys, open RA looks very cool! Any chance you will port it to iOS? That would make the world a better place. Hello mod developers and everyone else! This is surprisingly my first post here as I am a HUGE fan of this project. To me, this mod expertly recaptures what the original classics were, but it isn't afraid to explore ideas for making some fine-tune tweaks and necessary changes, whether it be for improved gameplay, fixing balance issues, modernizing the mechanics, etc. I am so very thankful for the hard, dedicated work everyone has put into making this mod a success. This truly deserves any and all of the praises it gets! First, the Hind should be moved back to the Soviets, and then, if OpenRA's engine allows it (which, if I'm not mistaken, it can), let the Hind and Longbow BOTH be equipped with a chaingun (vs infantry only) AND missiles (vs vehicles/structures only). Both crafts in real life do have both weapons, after all, so it makes sense; remember, also, the original RA cinematic intro did feature a Hind shooting missiles. Then, for giving each helicopter its weaknesses/strengths (while still maintaining that sense of balance), there should be subtle differences in firepower between these two air units. For an example: The Hind was originally chainguns only, so let it deal more damage than the Longbow's newly acquired chaingun; the Longbow was originally missiles only, so let it deal more missile damage than the Hind's. Another example (or in addition to the above): the Hind could have a higher capacity for its chaingun ammo than the Longbow, but the Longbow could have a higher capacity for missiles than the Hind. Differing variables to make for an interesting and balanced gameplay. It might take some effort to get the balance feeling just right, but I do believe with enough tweaking and gameplay tests, it can be accomplished. Again, this is all dependent on if the engine can allow this. What do you guys think about this possibility? Can this work? Of course with the Hind returning to the Soviets, it's possible that further balancing may need to be done for the Yak and Mig to ensure each unit is desirable in their own way. Now, as for the Soviets having airfield units and the Allies not, I'm actually just fine with that. There are multiple things that the Allies have which the Soviets do not have, and vice versa. With that said, though (and this is me just thinking out loud), what if the Allies did also have access to an Airfield? I'd think that only one jet would be plenty; just enable the jet to have an anti-infantry nose cannon AND anti-vehicle missiles, which will basically balance out the Soviet's Yak and Mig. For the role, the Warthog would make perfect sense (I know it's in TD, but it could function well here too - just as there were originally other units ported over to RA from TD) Again, just thinking out loud with this, but I'd be curious to hear what other people might have to say of it. I personally am okay with this. In my opinion, it's a nice, extra feature to have for players during MP, as an OPTION if they wish to have it; depending on the map, I believe there are even necessary times for having this. So, I wouldn't remove it from RA. For those who are less in favor of it, perhaps it would be best and feel less invasive for RA (and other mods) if it weren't as the default, but rather, you'd have to check the box in the options tab? Simple change. By the way, the mod for TD (and Dune 2000?) used to have this feature, I believe, but it's currently not available - I'd say bring it back, for the same reasons it be available for RA. I know it's been a few months, but I would like to voice my agreement with your points on the Hind. It belongs with the Soviets, and its being in the Allied tech tree is really jarring. I don't think the American-made M113 APC should be with the Soviets. It's not as unsettling as the Hind being moved to the Allies, but, still, for the same reason, it feels a bit off. My suggestion about this is: Since creating a new vehicle can be a welcomed idea (when necessary and appropriate, such as the useful and fitting Mobile Flak), let the Soviets have another new vehicle for transporting infantry, which, I believe, should be based off of the BTR-60, and then move the M113 APC back to the Allies where it should be. I think I read somewhere of somebody else making a similar suggestion as this, so it's good to know I'm not the only one who thinks this. Then, since the Allies and Soviets will each have their own type of APC with differing appearances, how about call the Soviet variant "Light APC" and either leave the Allied APC as just "APC" or rename it as "Medium APC" (personally, I'd lean more towards the latter)? Just like there is a "Light Tank", "Medium Tank", and "Heavy Tank". And, since the Soviets do not have an air transport (they should never have the American-made Chinook, btw), should this BTR-60 unit have a unique ability about it? Could/should it be able to also traverse in water just like the real-life vehicle can? And/or, with the Hind (hopefully) back to the Soviets, and since these can be used for transporting personnel in real life, should it be allowed to transport a single infantry or 5? And/or, what about possibly enabling the Soviet's new Mobile Flak unit to carry a single infantry (just like the Allied Ranger now can)? Therefore, if the Hind and Mobile Flak BOTH were allowed to carry some infantry, perhaps then a new Soviet APC wouldn't be necessary; the original APC should still go back to the Allies, though. Thank you for reading, and thank you for this awesome project! Again, 100% agreed, although I think the BTR-80 might be a better fit, seeing as the Heavy Tank looks like a T-64B or T-80 in the cutscenes. Why have the mods no original tech tree and new units? 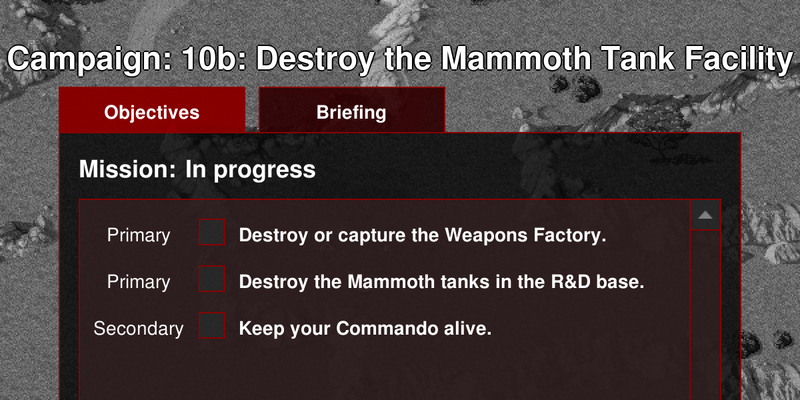 I am not aware of any similar projects for Tiberian Dawn, but we provide all the tools you or someone else would need to start one using the Mod SDK. This game should get more praise.